Just a quick note to let you know about an article of mine which appeared in a recent issue of The Luther Story, a bi-annual magazine published by Luther College at the University of Regina. The story is entitled “Painting a Legacy” and highlights the lives of service lived by local residents John and Monica Kurtz. The Kurtz’s are a great example of the doctrine of vocation as they serve God and neighbor according to the abilities and means they possess. For the Kurtz’s, that’s meant a life filled with art. Read the article here (scroll down to pages 9-11). The latest issue of the The Canadian Lutheran included a number of letters-to-the-editor on my recent article “‘Can you hear me now?’: Evangelism for the 21st Century world.” It was exciting to see so many people engaging with the article’s content as well as engaging with another article in the same issue highlighting CFW Walther’s thoughts on the place of the Confessions in the Lutheran Church. Some of those who wrote in thought they perceived a distinction between these two articles: mine which highlighted the importance of speaking understandably to the world around us, and Pastor Teuscher’s which highlighted Walther’s well-deserved regard for the Confessions. Dr. Edward Kettner (professor of Systematic Theology at Concordia Lutheran Seminary, Edmonton) writes an excellent response to these letters demonstrating that there is no necessary contradiction between the two articles. “The need the world has for a clearly proclaimed Gospel and for compassion,” he writes, “in no way absolves us from the responsibility [of] reminding ourselves what the Gospel actually is.” Well put. If we are to proclaim the Gospel to the world, we must first understand ourselves what the Gospel is. And the Confessions act as a guide to a right understanding of the Gospel, of Scripture, and of the faith we profess. 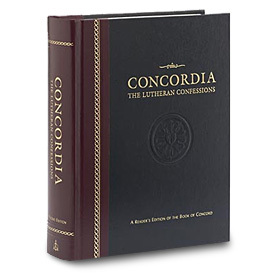 Individual study of the Confessions can certainly help Lutherans grow in their understanding of Scripture and their faith in God – a method by which we can learn to “leave the elementary doctrine of Christ and go on to maturity” (Hebrews 6:1). I know that my own personal reading in the Confessions has bolstered my own faith. That said, it is certainly possible that not everyone will find the Confessions so easily accessible. They do, as might be obvious, speak the language of another time and place. And while it is certainly an admirable goal to want to see the Confessions read and understood in the houses of laity across our nation, it is, I tentatively suggest, perhaps not a realistic goal. The Book of Concord can be a difficult book for those not used to such in-depth theological discussion. It can even be a difficult book for those who are used to in-depth theological discussion. Now, consider the Latin terms substantia (substance) and accidens (a nonessential quality). They are not words of Holy Scripture and, besides, are unknown to the ordinary person. So they should not be used in sermons before ordinary, uninstructed people. Simple people should be spared them. But in the schools, among the learned, these words are rightly kept in disputes about original sin. For they are well known and used without any misunderstanding to distinguish exactly between the essene of a thing and what attaches to it in an accidental way. (FC Ep 1:23-24). This passage tells us two important things: one, that theological “jargon” should never be entirely abandoned; it has its place in the discussions of those instructed in theology (“the learned” – both clergy and laity); second, that our public proclamation must focus on being understandable – intelligible – to the “ordinary person.” Our sermons should never descend into academic Churchese. Likewise, the “ordinary person” may well need to be spared reading the Confessions if the language and concepts prove too difficult. That does not mean however that the Confessions do not have their place in the lives of Lutheran laity. No, the average person in the pew needs to hear the Gospel message of Scripture, a message the Confessions faithfully expound. This is why we need our pastors to speak clearly from the pulpit. They must clearly explain – in everyday common language that everyday common people can understand – the incredible message of Grace found in the Word of God. They must teach the laity the meaning (if not the literal words) of the Confessions, so that the laity may more carefully read and understand the Scriptures. When it comes to Confessional preaching, we need clear teaching as much as ever. I recently learned that my blog has been included in a list of the “Top 50 Lutheran Blogs” compiled by Tim Dalton of TheologyDegreesOnline.com. I know. I’m as surprised as you. Dalton’s website, as the name suggests, is intended to help people explore potential online theology programs. But the blog section of his site seems to be devoted to “top X lists”. Other posts include the Top 50 Baptist blogs, Catholic blogs, etc. 27. Captain Thin : Be impressed with the musings of this recent graduate who blogs about many subjects relevant to the Lutheran world. He is also a chairperson for the Board of Evangelism, a group that is a part of Lutheran Church-Canada. I need to point out that the last part isn’t quite right. While I chair the Board of Evangelism in my own congregation (which is a member of Lutheran Church-Canada), Dalton seems to imply I chair a national board. Still, I appreciate Dalton’s kind words. I am glad so many people and churches have found the list helpful in their own discernment processes. On average, a minimum of 150 people view that list a day (some days the number well exceeds 200). I hope it will continue to be useful to those still in the discernment process. I just returned from seeing Harry Potter 7: The Deathly Hallows pt. 1 this evening. It was brilliantly executed. Still, despite my own admiration for the movie (and the books), we all know that the Harry Potter series has gotten a lot of flack from Christians throughout its run. In my opinion, an awful lot of it has been unjustified. Her books might not be as overtly Christian as C.S. Lewis’ Chronicles of Narnia, but Harry Potter is nevertheless deeply influenced by Christian ideals and symbolism. That symbolism is perhaps most evident in the final book, The Deathly Hallows. Christianity Today had an interesting article entitled “Harry Potter 7 is Matthew 6” back in 2007 when the final book came out. Given the public rush to see the first part of its film counterpart, it might be worth rereading that article to remind ourselves of how Rowling’s own Christian faith manifests itself in the story of the Deathly Hallows. Captain Thin is powered by	WordPress 5.0.4 and delivered to you in 0.400 seconds using 31 queries.